My approach to the restoration has been to keep things as standard and drive the car for a while, before making any modifications. The two main areas that I have deviated from this are; fitting an EDIS Megajolt electronic ignition system and using the Mangoletsi cable throttle linkage. The standard throttle has an inherent amount of free play due to the numerous joints in the linkage. The decision to fit the Mangoletsi throttle was aimed at improving the throttle response by removing this play and was based on the views of numerous forum members. My slight reservation was the appearance of the cables within the engine bay, as they arc from the pedal housing to the inlet manifold. The kit was ordered from SNG Barratt before the engine had been installed in the car which made the initial fitting of the components much easier! Although the completed inlet manifold and carburettors would be removed as a completed unit to fit the engine from underneath. The kits are very well made and came in four clearly marked bags, and with detailed instructions. Most of the components are already fully assembled and pre-set so the installation is very straightforward. The system uses twins cables to balance the load on the levers, providing a smoother operation, and the cables were the only components that would have to wait until the engine was in situ. The first bag contained a linkage plate and gaskets which simply fits between the carburettors and the inlet manifold. 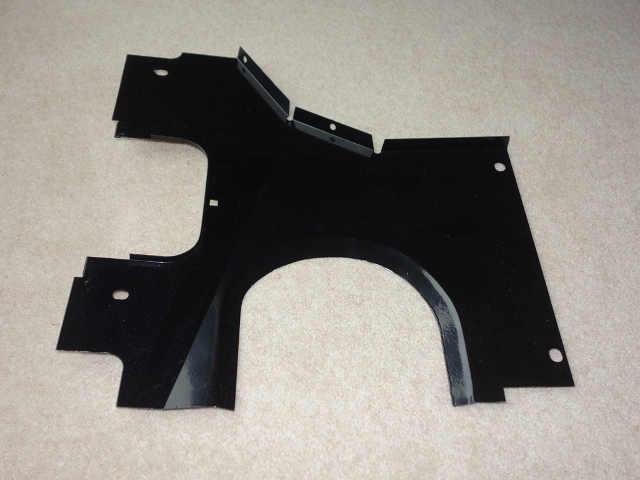 The gaskets used are thinner than standard to compensate for the added thickness of the plate. The carburettors are re-fitted and then the kit’s spring carrier bracket is attached to the linkage plate. Pre-fitted to the bracket are the adjustable outer cable abutments which would be adjusted during the final set up. The carburettor’s standard SU throttle levers are replaced with ‘aircraft standard’ rose jointed levers, which have a quality feel to them, with a smooth and precise operation and no free play. The top rose joints are bolted to their respective levers on the shaft of the linkage plate. The only slightly fiddly part of the installation was synchronising the operation of the three carburettors. Although this was adequately covered in the instructions. A jig plate is used to lock the linkage to a datum position to fit the rear rose joint tie rod, which has been pre-set to a length of 21mm. The front and centre tie rods are then fitted in turn and their lengths adjusted so the brass throttle plates all close at the same time. An entirely new pedal housing is also included which allows the pedal position and length of travel to be adjusted to suit. Although it has been left at the pre-set 40mm of travel for now. Any fine adjustments will have to wait until the car is completed. I should have been expecting it …. I then hit a major snag. It was all going far too well up to that point!! When the pedal was depressed, the top of the pedal lever fouled the starter relay mounted on the bulkhead. I thought the relay may have been incorrectly mounted but old photos confirmed the relay was in the correct position. The new pedal housing was the problem! Even mounting the relay on the wrong side of the bracket didn’t solve the problem. In fact it made it worse! The lever now just hit the relay bracket instead but also, it was then impossible to connect the wires to the relay. The reservoir bottles were in the way! In the end I contacted John Mangoletsi to find out why I was having problems fitting it. He was most helpful and was unaware of this issue, as it had not be reported to them before. A different kit is produced for 3.8 and 4.2 models and each has to be compatible with all the in-flight changes that Jaguar made at the factory. It soon dawned on me that the relay position had changed right at the end of the S2 production run, as I found out when my wiring puzzle was solved. The relay moved to the engine bay bulkhead with the introduction of the ballast resistor. An additional relay loom was also added to wire in the relay in its new position. A loom that took ages to track down. John Mangoletsi indicated that the kits were specifically designed to fit all the models and were sold as such. He kindly offered to visit to see the issue in person and come up with a revised solution for mounting the relay. One that could then be offered for the (few) cars which had a ballast resistor. At this stage I realised I was being a bit dim! I already had the solution: the other change I was making was the EDIS Megajolt ignition system which removed the need for a coil and therefore the ballast resistor. I could simply move the relay back to its original position on the bulkhead underneath the A-post and do away with the additional relay loom completely. Problem solved! The final tasks were to connect up the cables once the engine was in place and tidy up the empty bulhead holes for the original linkage. I chose to fit socket head button screws rather than blanking grommets. In summary, the Mangoletsi throttle cable linkage is a quality bit of kit and could probably be installed in a day or a lazy weekend. I will have to make a point of driving a standard car so I can feel the difference to make sure it was worth it! 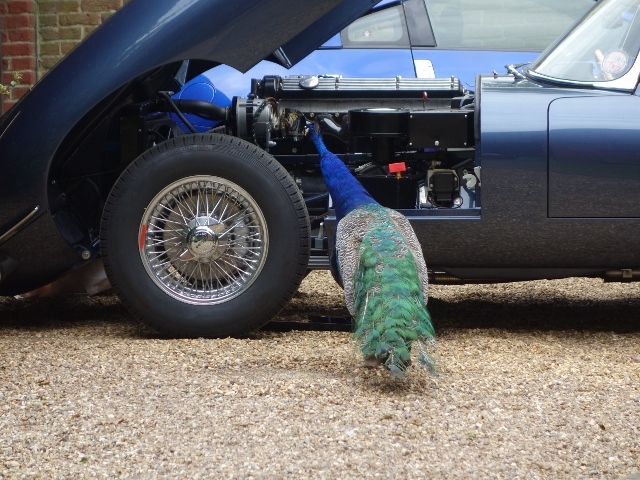 The weekend had been chosen for attempting to start the engine and the usual additional help was sought, although this time only John from the E-Type International Rescue team managed to secure the necessary leave of absence. However, before any attempt could be made, there were quite a number of tasks that still needed to be completed; seal and fit the fuel tank, finish off and test the wiring, connect up the battery, connect up the EDIS Megajolt electronic ignition and complete the Mangoletsi throttle linkage to name but a few. Retrospective posts covering these will be added shortly. The pressure was on! The sealing and painting of the fuel tank was only just completed in time to enable the tank to be fitted the day before. Although I hit a major snag …. it didn’t fit! The mounting points didn’t align with those on the body! The solution was to leave it in place and just connect up the fuel lines for now. It will have to be sorted at a later stage. The time lost in trying to fit the tank resulted in the wiring and battery tasks not even being started by the morning of the starting attempt. Therefore the fuses for all the non-essential circuits were removed to limit the amount of testing/checking required before starting the engine. I had permanently wired in a connection for my CTEK battery charger, which has a ‘supply’ mode delivering 13.7v. In this mode the maximum current that can be drawn is limited, enabling the circuits to be tested more safely. The charger was connected, the ignition switch on and, much to my relief, the fuel pump ticked into action. Rapidly at first and then settling into a slower rhythm. Moments later, fuel started leaking in numerous places in the engine bay! Power was swiftly cut and the leaks addressed in turn. The first was the fuel line connector which had gone in cockeyed into the filter housing. The fuel inlet pipe was slightly too short which had resulted in the misalignment and cross threading. The only remedy was to re-tap the thread. The only taps I had were of a dubious Chinese origin that I had been advised were best stored in a bin! Where they now reside. Fortunately we were able to make an emergency trip over to the rather well equipped McLaren factory to re-tap it and allow progress to continue. Even with re-tapping the thread, fuel was still leaking. The culprit was narrowed down to the new brass connector which had a collar before the thread started. This limited the amount of the thread that was engaging before collar came into contact with the olive. Therefore making it more prone to cross-threading again and the ability to obtain a quality seal against the olive. At this point I would have given up but John suggested a cunning plan of reversing the fuel filter so the brass fitting would use the undamaged thread. PTFE tape was also applied to the threads to help avoid leaking until a new pipe is made. The plan worked. The other leaks were due to using aluminium crush washers on the carburettor banjo bolts rather than fibre washers. I suspect this might be a result of the zinc plating not providing a sufficiently smooth surface on the joint fuel pipe and banjo bolts. Some of John’s replacement handcrafted washers worked a treat. Once the fuel issues were resolved, we needed to make sure oil had been circulated around the engine and sufficient oil pressure had been achieved. The battery was connected to allow the engine to be turned over on the starter motor to operate the oil pump. However the plugs and coil pack leads were removed to stop the engine starting. There was no reading on the oil pressure gauge so we started to suspect the oil sender might be a fault. It was removed from the engine and the Mityvac vacuum/pressure pump (normally used for bleeding the brakes) jury rigged to check whether it was working correctly. It was and was measuring accurately, although with a fair amount of lag. An oil pressure of about 18-20 lbf was finally achieved after running the starter motor in spurts for a while. A few from the E-Type forum confirmed that this should be sufficient to start the engine. The carburettors were adjusted to their default starting position: the damper oil levels checked, the slow running screw fully screwed down and then backed off two full turns and the mixture adjusting screws unscrewed to set the jet flush with the bridge before turning them each down by 2 1/2 turns. So, for the first time in 18 years, the key was turned to start the engine …. it started on the first turn of the key!! The only remaining problem is some airlocks in the coolant system which caused the coolant to be expelled from the expansion tank once the engine was stopped. Although I’ve found this is not uncommon.